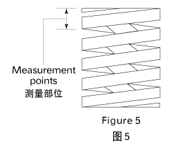 Handling precautions | Products | Tokyo Hatsujyo Manufacturing Co.,Ltd. 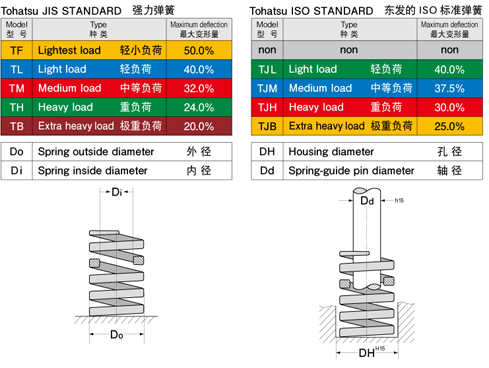 Before setting or using Tohatsu springs, please read the Instruction manual and keep it by yourself. When using or setting springs, please adhere to the following guidelines. The indication and meaning of this text are as follows. Failure to adhere to this text could result in the danger of serious accident or human injury during manufacture due to scattering or broken springs. Failure to adhere to this text could result in damage to spring and inplement of periphery. Points to understand when using these products. Please use within the deflection rates noted in our catalogue. Exceeding this rate will result in early breakage due to sudden increase in load or coil contact etc. Scratches on the surface of the spring lead to early breakage. If scratches on the spring are found, we recommend that the damaged item be replaced with a new spring. Please avoid using in corrosive environments. There is a chance of rusted springs breaking early, so please replace such items with a new spring. Even products that have been treated with anti-rust machining lubricants may develop rust occur over an extended period of use. If a foreign matter becomes caught in the spring’s wires during use, it may lead to abnormal loads or collision loads due to entanglement which could cause the spring to break or become damaged. Care must be taken to ensure this does not occur. Please install the spring in a slightly compressed condition (state of initial pressure). Using the product without the initial pressure being applied may lead to breakage at an early stage or other forms of damage during abrasive contact with other items or through abnormal loads. 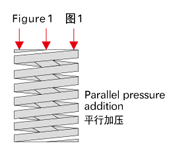 Set the product so that the spring mounting side and the applied pressure side move in a parallel manner over the entire region used. 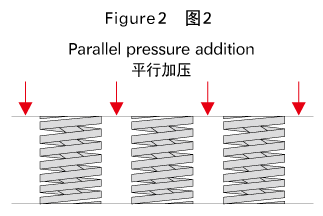 The product may break at an early stage or become damaged due to abnormal loads if it is used with pressure applied in an inclined state (see figure 1). When using varying and multiple types of springs simultaneously, it is important to take into account the overall balance and the deflection rates used for each spring (see figure 2). Please do not use springs in vertically connected groups. This makes the springs easy to buckle and could lead to spring breakage (see figure 3). 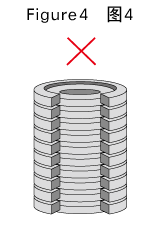 Please do not place a spring of a smaller diameter inside a spring of a larger diameter and use on the same axis. There is a possibility that the wires of one spring may become caught in the other leading to early spring breakage (see figure 4). Usage of the spring without a spring guide makes the spring easy to buckle or bend and may lead to early spring breakage. If used, please align the guide with the inner or outer diameter of the spring. If a metal guide is used on the inside diameter of the spring it may interfere with and wear down the spring leading to early breakage. 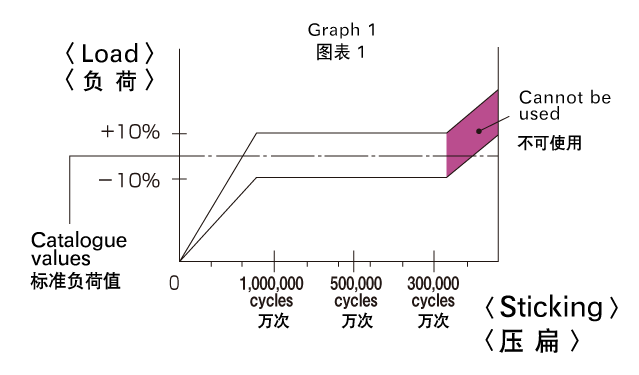 The condition that the spring be used in a normal temperature (40℃ or below) is noted in the catalogue’s Loads and Standard Values. Usage in ambient temperatures exceeding 80℃ may lead to free height reduction and overload or durability reduction. Also, avoid exposure to temperatures of greater than 200℃ before use. Please do not store springs in a compressed state for long periods of time. 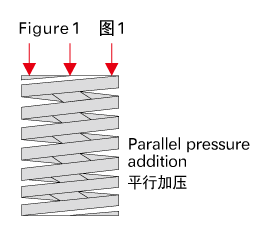 Storage in a compressed state causes fatigue to the spring. Reused springs may break easily and so the exchange of old springs with new products is recommended. Extension springs become dangerous when the hook part of the spring is detached. Please pay attention to the condition of the hook part during setting or removal of the spring. Please do not use compression springs with a force applied other than in a compressive direction. (for example extensive or torsion forces etc.) Please do not apply forces other in an extensive directing to extension springs. Doing so could lead to deformation and breakage. Using the spring for purposes other than which it was intended (hammer, weight, etc.) may lead to unexpected accident or injury. Springs are made from hard steel. This characteristic means that parts applying or receiing pressure from the spring may begin to flake due to abrasion during use. Please take measures to protect and re-enforce parts above and below the spring. Weakening of the product will occur in accordance with the frequency of use, please replace the spring when necessary. Please perform inspections to ensure that the product is always treated with an adequate level of anti-rust machining lubricant. Please note that "Uncoated, MR, LR, Other springs (not designated as anti-rust treated)" are not coated by anionic electro-deposition and so are particularly susceptible to rust. Please store in a safe place that is free from humidity and high temperatures and do not allow other people to handle. 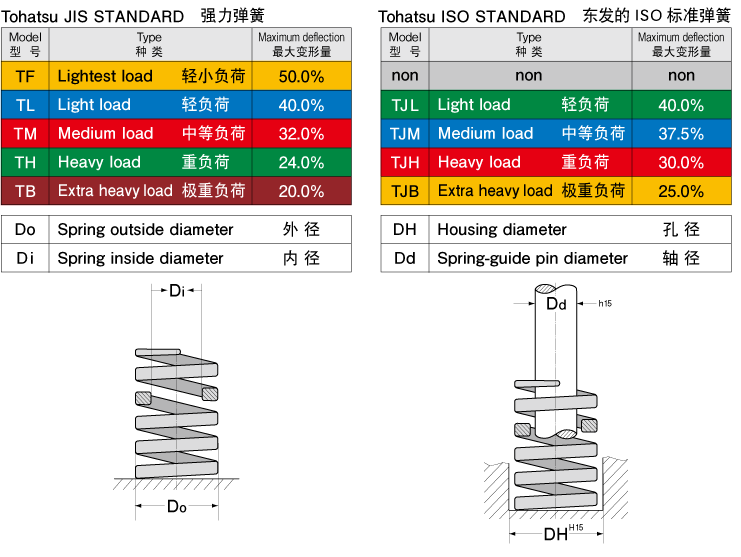 Tohatsu springs are made from steel alloys (silicon crome steel used for springs, piano wire, stainless steel wire for springs) and so can be disposed of in the same manner as regular scrap metal. Customers who have special conditions related to the disposal of coated materials should refer to page 8 or contact us for advice. 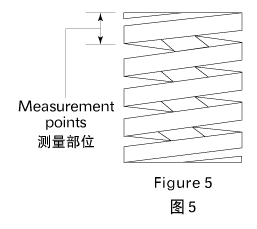 Spring dimensions are measured from the 1st or 2nd coil from the spring’s end section (see figure 5). There may be instances wherein the actual load values fall outside the allowable load variance with the load at a low level and at a high level as the load nears the maximum deflection rate (sticking) in relation to load calculation values with strong spring fixed numbers (refer to graph 1). Even when the identification colors are the same standard loads and standard dimensions may vary. Please take good care when selecting springs.